that help you A.C.E. even more? Already have an account? Haven't used the new apps? Have you always wanted to have your presence known? Perhaps you heard of how people generate leads online but haven't found a way how? 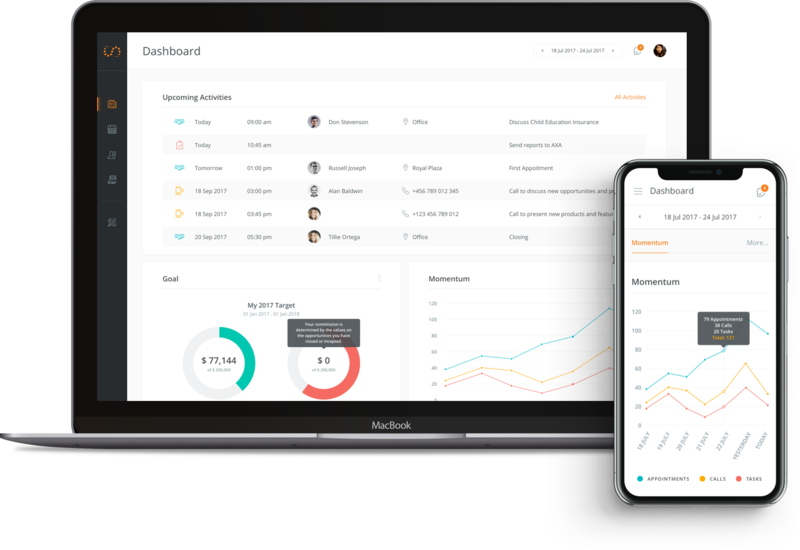 Rookie is now available for financial professionals to build their professional profile and generate leads passively online, even on their mobile devices! Advisors and agents can spend less time looking through client lists for opportunities and more time building meaningful relationships. 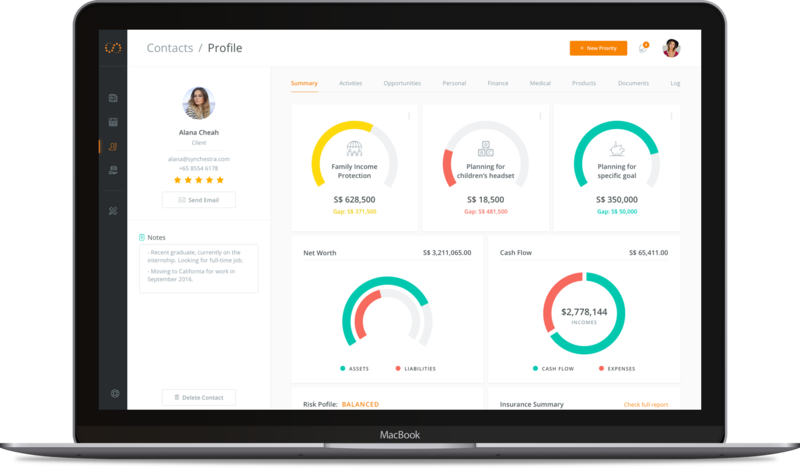 Consultant makes objective and compliant advice available to even inexperienced advisers and agents, all without spending much effort on preparing for cases and generating insurance summaries. On top of that, Consultant allows consultants to keep themselves on track by organising their activities and setting their goals. With more advanced tools made simple for the productive professional, so that closing existing clientele is made easy. Automatic touchpoints create attention and interest; curated sales content ensures desire and action. Retirement Planner can be used to get existing clients to find out more needs for themselves. Achiever will help you to discover the top sales opportunities, engage your prospects more objectively and gain access to customisable charts according to your process. Professionals on Achiever will spend more time with the right people, only doing their favourite thing - closing. What else can Synchestra do? Whether you're a new financial advisor or a veteran insurance agent, there's bound to be an app available on the marketplace for you. Start exploring now! You're young and motivated. This is your first time in sales and you are looking to build your initial pool of contacts. 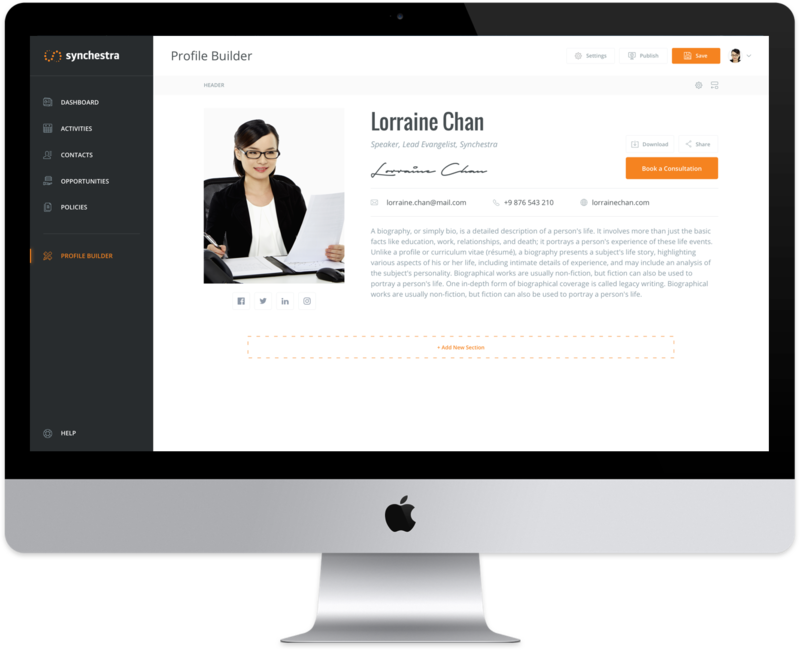 Synchestra Rookie is the lowest cost solution that will solve your initial prospecting woes by positioning you on social media. People reading your profile will be able to zoom in on your unique processes and getting referrals will be easy as pie. If you're ready for Synchestra Consultant, manage every prospect that comes your way and systemize your processes so that you'll never forget what to do with every client. You have been in the industry for the past 5-10 years. Awards are a given considering how good you've become at your job. 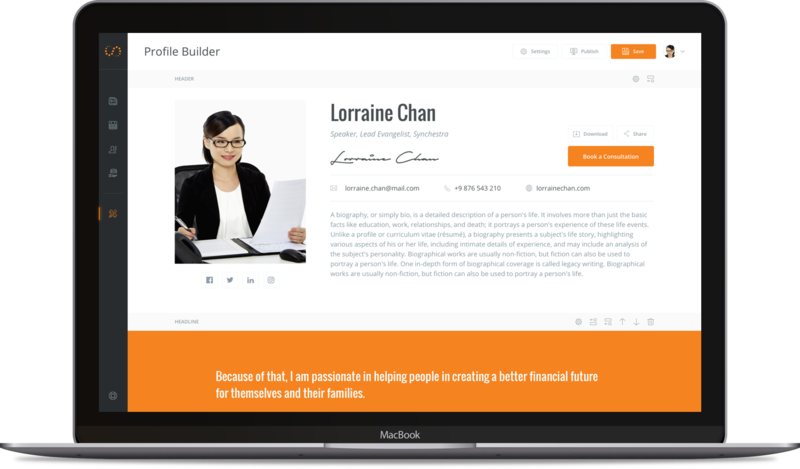 Use Synchestra Rookie to brand yourself to your new prospects and post the good things people say about you to attract even more people. Synchestra Consultant will give you full clarity over your daily activities, so you'll never have an unproductive week. With Sales opportunities access, you will know exactly who to meet up with, and make sure your face-to-face meetings are always productive. As an achiever, you are comfortable in your processes, and your meetings are mostly productive. Synchestra Consultant will allow you to manage that huge client database of yours, without you spending too much time. As a Synchestra Achiever subscriber, you can even get suggested contact points and even sales opportunities pushed to you. Synchestra Achiever also gives you the most customizable experience so you see the most familiar steps towards closing every client! Start Your Success with Synchestra Rookie Today! If you are a financial sales professional, perhaps you are struggling with postponed, or even cancelled appointments. Maybe you're just not getting the due respect as a professional. If you could get some of these problems solved, and perhaps even end up with a few extra incoming leads a month - wouldn't that be cool? Synchestra has built a tool for all of you, built for financial sales professionals, by financial sales professionals. This will help you stand out from the competition in a congested arena of noise. Of course, you want only the good stuff to be put in your profile. See, we've got the perfect mix of keeping it open to your creativity, yet we've given you some of the best suggestions based on feedback from real professionals. Add the media that show that customers love you and respect you. And more will follow. Set the context even before you meet up, when they know what to expect, they will know how to behave. tips, and insights from Synchestra!